This festive season, celebrate at Buona Terra and indulge in Italian culinary delights featuring an exquisite traditional Italian Christmas Menu ($168+) as well as a seasonal inspired New Year’s Eve Menu ($228+) specially created for the holidays. Chef Denis Lucchi is set to tantalize taste buds as customers revel in Christmas festivities and ring in the start of the New Year. Available from 24-25 December 2013, the Christmas Menu is a six-course degustation menu inspired by the tastes and flavours of Chef Denis’ childhood memories of Christmas celebrations. The menu starts with Filetto di vitello Rosa con Salsa Tonnata, a light appetizer of Thin Slice Veal Tenderloin drizzled in Tuna and Caper Sauce. 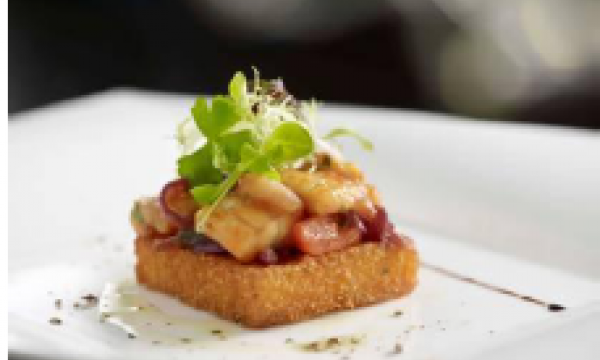 The velvety Capitone in Umido con Cipolle Rosse e Polenta Croccante – an Eel Stew with Red Onions atop Crispy Polenta carries an elegant mélange of flavours and textures to excite even the most jaded taste buds. Celebrating the season’s most luxurious ingredient, the Christmas menu features the diamonds of the kitchen - truffles. Tortellini in Brodo della Tradizione con Tartufo Nero is a dish to warm the heart with Tortellini served in Broth and paired with delicate shavings of intoxicatingly aromatic black truffles. The rich flavour of the Ricotta and Spinach Cannelloni is enhanced by the generous serving of the sweet and complex Red Cow Parmesan cheese in Cannelloni Ricotta e Spinaci con Crema al Parmiggiano.